How did the Coleman Family come to be playing together in The Class of '58? We first met at a Rock & Roll dance in 1982, when we were 19 (Howie) and 17 (Chris) and have been rockin' together ever since! In those early days we could never possibly have dreamed that the long and winding road would eventually bring us to the privilege of playing in a Rock'n'Roll band with our two sons. As the saying goes, back then, our boys were nothing more than a twinkle in our eyes - We had far more important things to do, like having fun and playing our music, with the occasional beer thrown in! Although we've always played in the band, for us being Mam and Dad, the real story of The Class of '58 began back in 1999 when a five year old John Coleman came home from school. He'd heard an older boy play the drums that day and said "I can do that" - and he could! 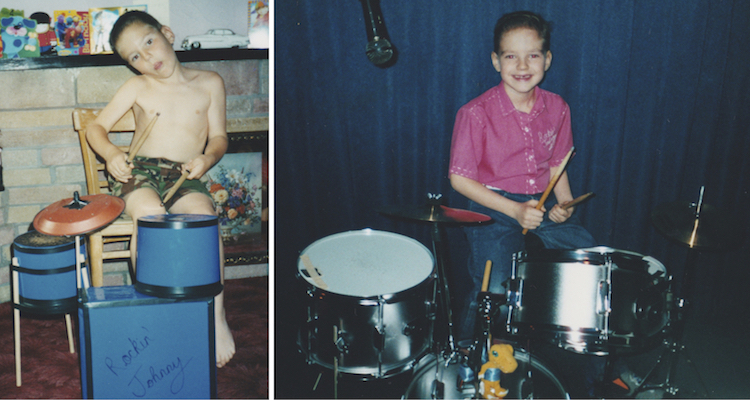 John came home from school after, hearing an older boy play the drums that day and said "I can do that" - and he could! Even at that young age he said he wanted to play with Mam and Dad, so Howie made him a cardboard box drum kit and he was ready to rock! 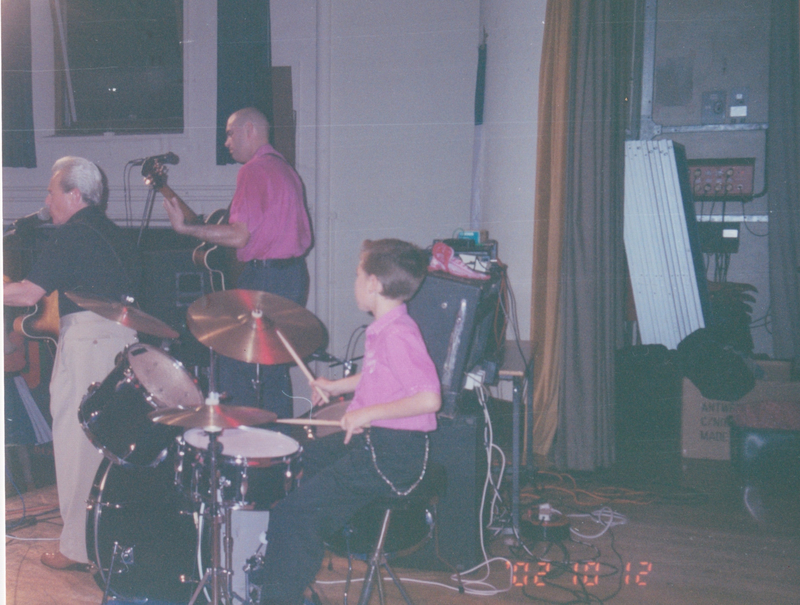 He had his first small, real drum kit for christmas when he was six and did his first real paying gig three months later, as a one-off (As The Class of '58), on his seventh birthday - With his two front teeth falling out just before we went on stage! After a brief thirty minute set and a very appreciative audience, his Mammy took him home to bed as he was tired! He spent the next twelve months honing his skills, while playing for his friends in primary school. We used to take the instruments into the school and play for the whole school on special occasions - From Christmas to Easter to the Queens Jubilee! It was a very special time for us; great memories. 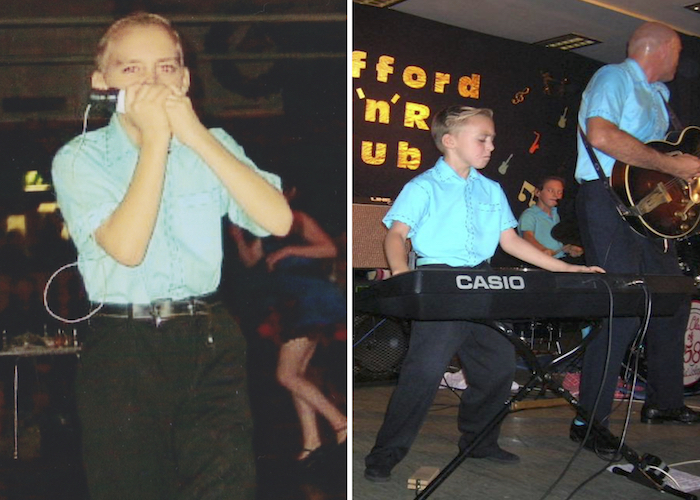 He progressed at a phenomenal rate, through his own natural ability, and after waiting three years his dream was realised when he was eight and joined the band permanently in 2002. We never thought he would be on the road so young but it came about more as an accident than anything else. DC was starting to have trouble getting time off work for gigs and told us last minute that he couldn't make the gig for the following weekend and the weekend after. We asked DC if he knew of any other good drummers and he said "Yeah, use Johnny, he's good enough - I know he can do it!) - and we did. As soon as he said that DC knew that John would become the permanent fixture in the band and has followed his progress ever since. He remains a great friend of ours. John's first major introduction to being on the road was at 8 years of age, on a month-long tour backing the legendary Charlie Gracie - Who couldn't believe his eyes and ears when he came on stage! Charlie said later that he couldn't believe it when he saw John on the kit and only expected him to play a song or two - He did the whole tour. While this was going on, younger brother David, was itching to join the band. He could see us all rockin' and wanted to be a part of it. Although he really wanted to play the piano, because his fingers were small, that had to wait. He started off on the harmonica and we'd bring him on stage to play one or two numbers. Howie then connected the Harmonica to a radio transmitter, which meant that when he came on stage to play his numbers, he could wander around the room playing. This gave him great confidence. He would wander around the tables, amongst the audience and would climb on any window sills, bars and radiators that he could find. At this time, because he only played a few numbers, he would sit on the side of the stage and handle security - Proudly wearing his black t-shirt that said "Road Manager" on the front and "Security" on the back. All the while, he was honing his piano skills on his toy piano. It wasn't long before he progressed onto the real thing and joined the band properly when he was seven - with his little legs dangling off the piano stool! David also had great natural ability and, like John, never had a single lesson - they could just do it. Growing up around music it was just natural. One day his Primary School headmistress asked David to play for morning assembly as the music teacher was ill. He proceeded to boogie-woogie through the entire sing-along! Different arrangement, maybe, but the kids loved it! This is a time that we look back on with great affection. Just magic. 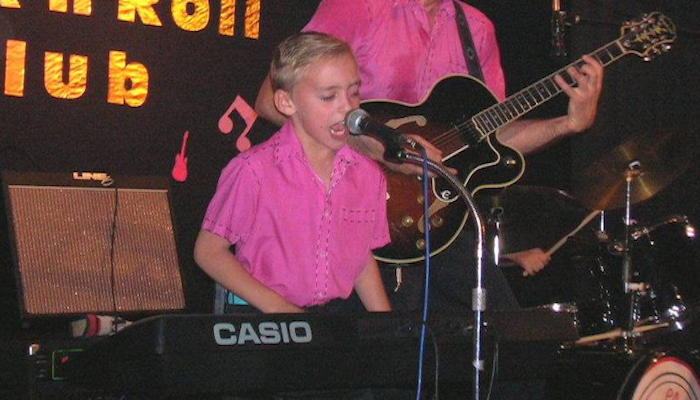 It wasn't long before he progressed onto the real thing and joined the band full-time when he was seven. Once he started gigging, he also improved at a phenomenal rate. People would always comment on his enthusiasm and how they could tell that he loved doing what he was doing. This genuine enthusiasm only had one downside - He'd play his piano so wildly, while rockin' away, that he would regularly break his keys - This was not only expensive but also very inconvenient, as some of his keys would fly off mid-performance, with some people taking them home as souvenirs! He quickly became the backbone of the band. 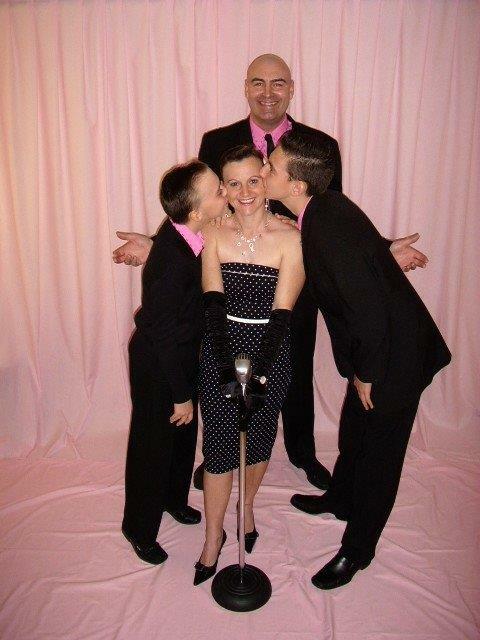 At the time, we'd sing a song acapella and David would stand on a chair because he couldn't reach the microphone and wanted to stand next to his Daddy! Ahhhhhhh! A while later, when he was older, he decided he wanted to sing a song after being inspired by Frankie Lymon's music and how young Frankie was when he started out. He came up with the idea of singing a Frankie Lymon medley, which he did right up until the time his voice broke - then poor old Frankie had to go! Things just evolved as time moved on. Occasionally, we would get the odd ignorant question like "How do you make your kids do it?" or "Do you have to be very pushy?". Although we felt that these questions were sometimes quite rude, all we could do was reiterate what we've always said - None of this was planned, nobody was pushed into it, it all just fell into place by accident and was all the boys' idea. In fact, we couldn't do what we do if we weren't an exceptionally close family and we didn't really love what we do, especially with all the travelling and hotel rooms! The only bit of advice that we ever gave to our boys, at this young age, was that if they wanted to play in the band then they would have to work probably three times as hard as any adult to prove themselves. This was because adults could perform drunk, scruffy, or just have an "Off-night" which, for some reason, was deemed acceptable. If The Class of '58 had an "Off night", we'd have ended up with "What do you expect with kids in the band?". This is a work ethic that we're proud to have stuck to, to this day - Always appearing on stage smart, clean and doing the best show we possibly can. Because of this, even then, we earned a reputation as a good-quality, reliable, Rock & Roll band. With the boys being so young it was imperative that school work came first, so gigs could be quite challenging logistically from a distance point of view. 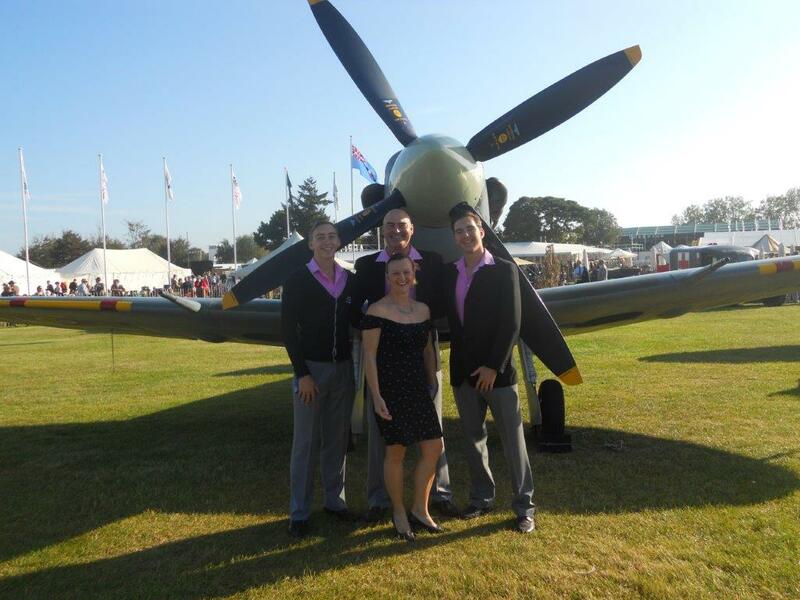 The schools were always very supportive and the boys learned a lot about the places we'd been to. It did mean though that we were unable to do very many European dates that we were requested for - Apart from DisneyLand Paris in December 2008, which was extra special as it was the week before Christmas. As the boys have said many times since they've grown up, they feel very fortunate to have had the unique, very special, childhood that they've had and continue to have because none of us have ever really grown up! Here we are! From those early years (Which now seem a long time ago), the band has evolved into a professional, sought-after, very busy band. 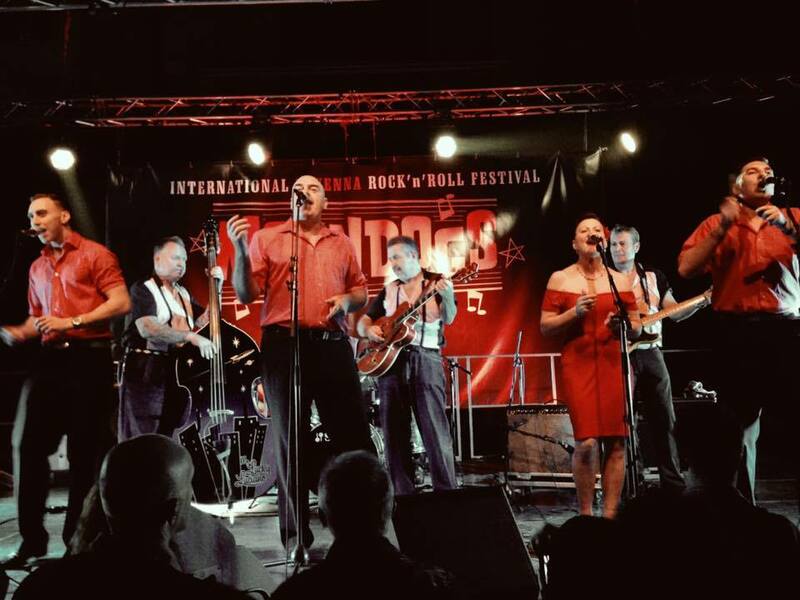 We've travelled hundreds of thousands of miles, as you can imagine, in the UK, across Europe and other parts of the world - Playing everything from Cruise Ships, Music Festivals, Hotels, Holiday Parks, Motor & Air Shows, Rock & Roll Dances, Private & Corporate Events and everything in between. We suppose that's just what musicians do! We've been, and continue to be, lucky enough to travel to some incredible places throughout the world. We've met some brilliant people and have had the fortune to enjoy some very special, unique experiences - We've been able to do this as a family, which is extra special because some things you just have to be there to appreciate; they don't translate in the re-telling. What's not to love? And that's the answer to the question! The one thing to be said though, when we see it all written down, is how far we've come since the boys started playing with us and how incredibly proud we are of what we've achieved.